As promised, this is how I do roast beef for "beef on weck." In episode one, we made the weck rolls, which are awesome, but become significantly more so when filled with freshly roasted beef and horseradish. And, don't even get me started on the au jus. There are many cuts of beef used for this, including top round, rump roast, and brisket, but I like to use a nice thick top-sirloin roast. Instead of cooking it in the oven, I like to pan-roast this on the stovetop. There are many advantages to this approach. 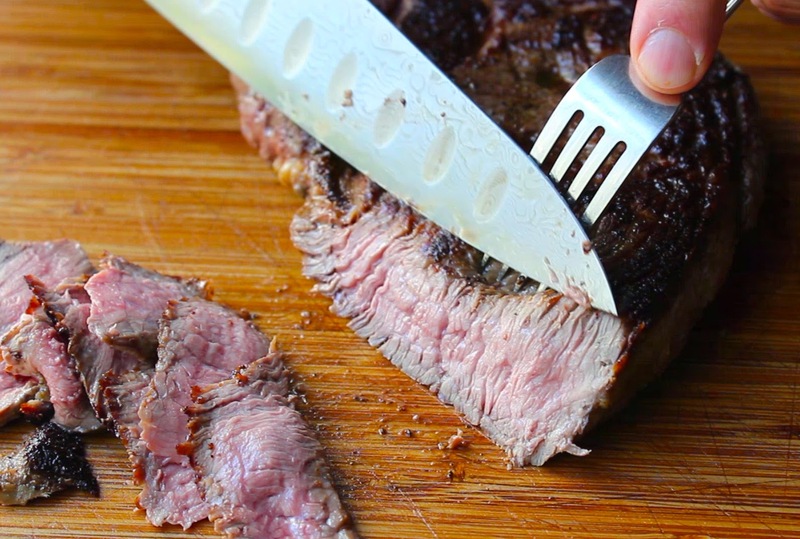 Since top sirloin roasts are only a couple inches thick, they cook relatively fast. They're also tender, flavorful, and because of their shape, very easy to slice thinly, which is one of the keys to this amazing sandwich. As far as the au jus goes, it’s only going to be as good as the beef broth or stock you use, but I have a great tip regarding where to find the nice stuff. Most of your higher-end grocery store chains, which have in-house butchery departments, usually sell homemade stocks in the frozen food section. It makes sense, since there are so many bones and meat scraps available. Not only are these products usually high-quality, they’re also pretty affordable, so check there before you use something out of a carton. Anyway, thanks for your patience, and I really hope you try both recipes, and experience Buffalo’s best-kept, and most delicious secret. Enjoy! Thanks Chef, this almost makes me homesick. Then I remember the winters and I feel a LOT better. Thank you, Chef John for all the videos you post! I've been meaning to ask this, but do you mind if I ask the brand name of silicon mat you use? Thanks again. I can't wait for your next video! This looks amazing! I don't understand why you call this au jus... makes no sense to me (I'm french but, I know, you don't care! ;), but this recipe is sooo mouth-watering, perhaps that explains it! Thank you sooo much! I can't say it enough! I'm addicted and your video's should be mandatory for teenagers to watch and learn. Seriously, that good! My wife told me this was "the best sandwich I've ever had and I'm 30 and have had a lot of sandwiches, so that's saying a lot." I laughed out loud :) Thanks for helping me to become an actual cook and not a recipe follower! We had this for lunch today. I made the rolls last night. Once again you hit it out of the park! Very tasty, we all loved them. For UK people, the best beef stock I've found available nationwide is the Heston Beef Stock from Waitrose. I'm just wondering if it's ok to just drink the remains of that au jus after you've finished the sandwich? Also, if you're making this for more than 4 people, can you get a bigger piece of meat, or is it better to get 2 or 3 2lb ones? Dang Chef! Dat' hunk of meat in dat' hot skillet sure do look good to carnivores likes' meself'. And da' way ya' done cooked it up sure couldn't have been any easier. Thanks! You're da' best! What the... That meat is RAW! I have eaten Beef on Weck all over WNY and this is the ONLY one I have ever seen cooked to less than medium well. More often, it's WELL DONE and then placed in a crock pot to keep it warm. I couldn't find a top sirloin roast at my local grocery store. Could you recommend a good substitute cut that might be more common? I'm just going to throw this out there: This post totally should have been titled "Beef on Weck 2: The Weckoning." I spent all day making this, and it worked out, which was a great relief because I have almost zero experience baking bread. The top sirloin I bought was too thick, I guess, because it took much longer to cook than yours, but I had started everything early for safety's sake. It ended up nice and pink and juicy. Man! The final result was fabulous. We had 2 guests, we all stuffed ourselves without mercy. One guest said she didn't really fancy horseradish, but she discovered she loved it on this sandwich with this sauce. And by a stroke of good luck, I had decided to go with much cheaper poppy seeds instead of caraway, and it turned out both guests claimed to hate caraway. Everybody was a winner!